Dr. Heiner Flassbeck: Graduated in April 1976 in economics from Saarland University, Germany, concentrating on money and credit, business cycle theory and general philosophy of science; obtained a Ph.D. in Economics from the Free University, Berlin, Germany in July 1987. 2005 he was appointed honorary professor at the University of Hamburg. Employment started at the German Council of Economic Experts, Wiesbaden between 1976 and 1980, followed by the Federal Ministry of Economics, Bonn until January 1986; chief macroeconomist in the German Institute for Economic Research (DIW) in Berlin between 1988 and 1998, and State Secretary (Vice Minister) from October 1998 to April 1999 at the Federal Ministry of Finance, Bonn, responsible for international affairs, the EU and IMF. Worked at UNCTAD since 2000; from 2003 to December 2012 he was Director of the Division on Globalisation and Development Strategies. He was the principal author of the team preparing UNCTAD's Trade and Development Report, with specialization in macroeconomics, exchange rate policies, and international finance. Since January 2013 he is Director of Flassbeck-Economics, a consultancy for global macroeconomic questions (www.flassbeck-economics.de). ). Co-authored ACT NOW! The Global Manifesto for Economic Policy published 2013 in Germany. A small prisoner of war exchange in Ukraine gives us a taste of how each side treats their captives. In the east the soldiers captured from Kiev's fascist Army are treated with dignity and great care. I've seen this over and over as the east tries to show the neo-Nazi troops that they are wrong about their fellow citizens who live near the Russian border. Those self-defense forces who were captured by Kiev's forces are returned looking beaten, haggard, and obviously suffering severe emotional trauma. Remember which side the US-NATO are supporting. Just this short clip should tell us alot. 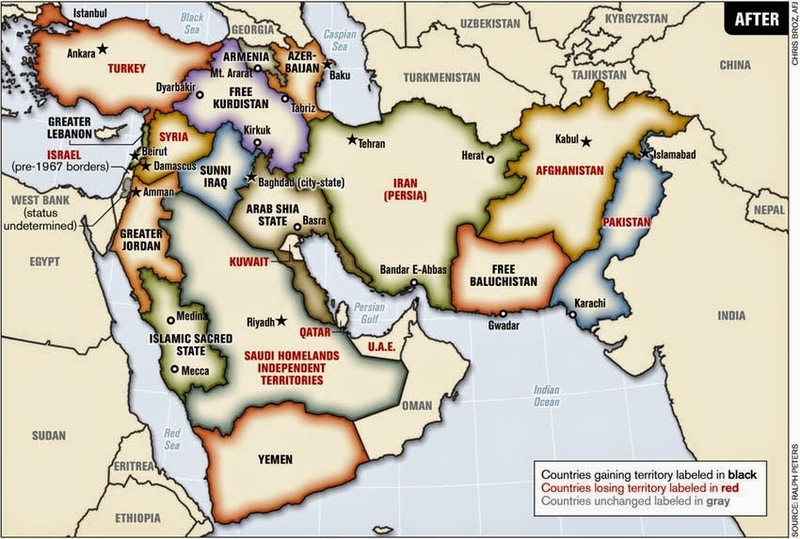 These maps were leaked to the public in 2006 from inside the Bush administration. 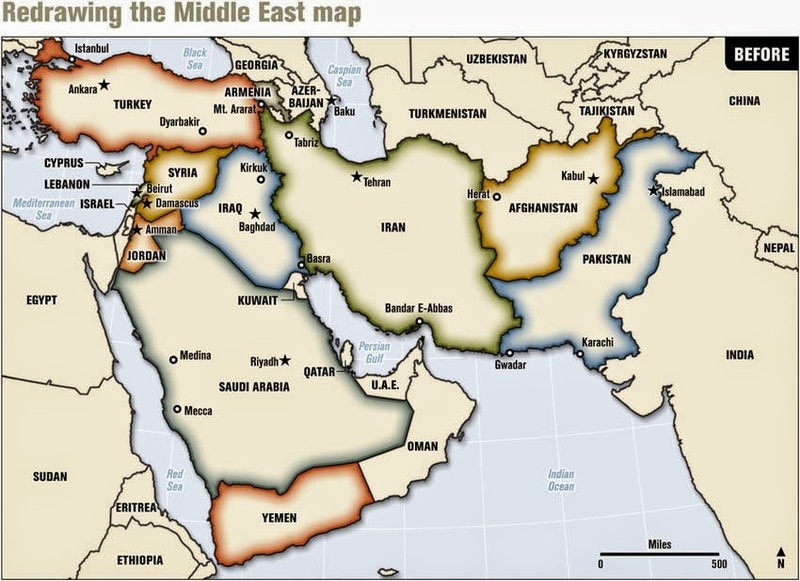 They reveal the plan to re-draw the Middle East to benefit the US-British oil corporations agenda. In 1991 I had a meeting with Paul Wolfowitz [former president of the World Bank and at that time the second deputy of US Department of Defense] and I told him that he must surely be satisfied with Operation Desert Storm (Kuwait). And he answered: Well, yeah, but not quite, because the truth is that we wanted to get rid of Saddam Hussein and we failed. But there is one thing we have learned - we found out that we can use our military in the Middle East, and the Soviets will not stop us. We now have about five to ten years, to clean up the area from the old Soviet influence before an appearance of a new big superpower that we will be able to challenge us. Clark's comments help to clarify the bigger picture for us. It's always good to know where your ruling oligarchy is going with the money they are stealing from the public these days. Now we can think about, discuss, and begin to deeply understand that Washington has become a central nesting place for the global pirate class of killers, tramps and thieves. London, Brussels, Bonn, Tokyo, Seoul, Tel Aviv, Kiev, and other capitals work in collaboration with the US in this ultimate heist. We are all called to be fighters against organized crime. 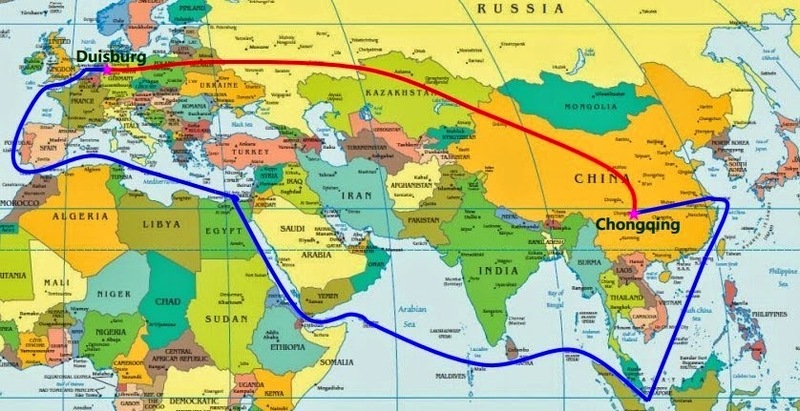 A central fear of the corporate government in Washington is the 'modern silk road' that runs between China and Europe. One reason for the Ukraine war on Russia's border is the American attempt to throw a monkey wrench into the middle of this new economic zone. Best part of this is the interview at 2:56 into the video. This man is a former-musician and three days ago was put on the EU's sanctions list. Many believe because of words like these in the video. 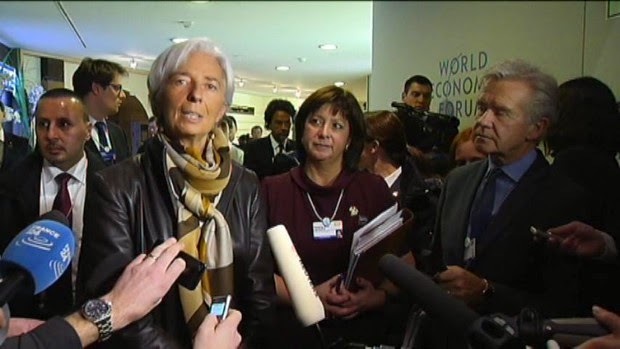 Ukrainian Finance Minister Natalie Jaresko (center) listens to Christine Lagarde (left) Managing Director of the International Monetary Fund. Jaresko, born in Chicago, received Ukrainian citizenship in December 2014, the day of her appointment as Minister of Finance of Ukraine. Special Report: Among the arguments for why Americans should risk nuclear war with Russia over Ukraine is that the regime that took power in a coup last year “shares our values.” But one of those “values” – personified by Finance Minister Natalie Jaresko – may be the skill of using insider connections. Today I joined a dozen others at Bath Iron Works here in Maine for the Ash Wednesday peace vigil. This event began the Lenten season vigils that will happen each Saturday from this weekend on through April 4. 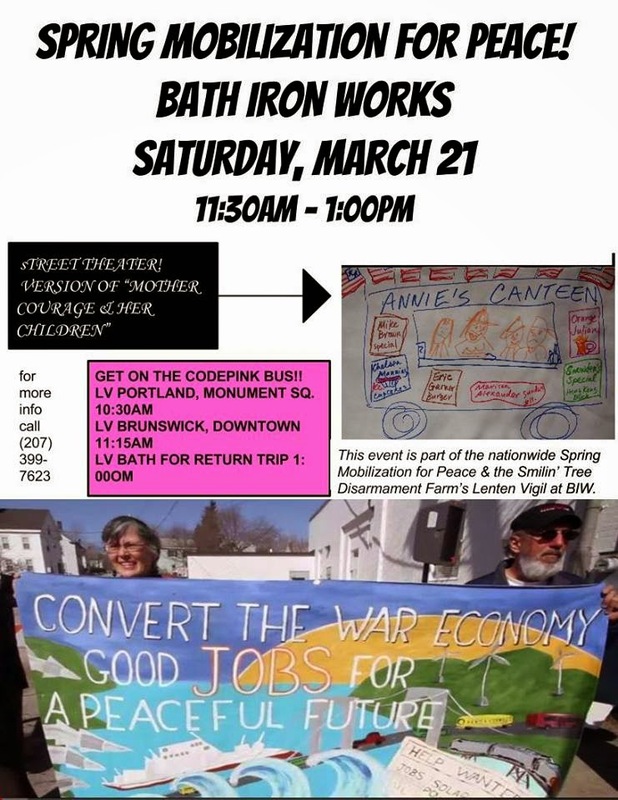 We'll gather from 11:30 am to 12:30 each Saturday on Washington Street in front of the BIW administration building. Lent is a time to fast from our culture of excess by resisting the temptation of militarism. We need to stand together to express our opposition to this ongoing crime against peace which is the building of these guided missile warships here in Bath. With us that day will be two activist leaders from Jeju Island, South Korea where a Navy base is being built that will port the destroyers built at BIW. Rarely do people in Maine think about where these warships go after they are launched and just how they impact local communities like Gangjeong village on Jeju Island. That 500-year old fishing and farming village is being torn to pieces as part of Obama's provocative 'pivot' into the Asia-Pacific in order to encircle China. Kiev troops surrounded in the city of Debalstevo have started to surrender by the hundreds to the self-defense forces. US puppet President Poroshenko declares victory as he pulls some of his troops out of their encirclement in eastern Ukraine. Several thousand more are said to still be there. What does Obama do next to save his Kiev Nazi project? Does he send in NATO war planes or drones to start bombing like he has done everywhere else - Libya, Iraq, Afghanistan, Pakistan, Syria, and Yemen? Will the Europeans finally find some courage to stand up to Washington and tell them ENOUGH is ENOUGH! Leave Ukraine alone. We can only hope. Yes, it is a vision of the Peace Movement “No to war – No to NATO”! The idea of the presentation is primarily to present our efforts to English speaking interested subjects, and to expand and strengthen anti-NATO network globally. This all aims at the world peace, safer future and general welfare for the mankind. Because there was ENOUGH wars and shedding innocent blood! There was ENOUGH occupation of sovereign countries and confiscation of territories and mining wealth on behalf of a global super power! Our objective is to “awaken” unjustifiable “sleepers” in order to recognise the ultimate goal of the aggressor alliance! The Peace Movement “No to war – No to NATO” is a network of over 50 non-governmental organisations and other legal entities in Montenegro. We were established in April 2010. How did we appear? It had all started from individual efforts of members of the editorial board of the IN4S portal (www.in4s.net) as the founders of the Movement – until the full membership of our Movement into the global anti-NATO alliance, starting from sporadic poster sticking activities to an entity that has to be seriously taken into account regarding the possible Montenegro’s entry into military alliances. From establishing the network until mid-summer 2013, our Movement organised a number of peace international events, with speakers from Scotland at the west to Russia at the east and Norway at the north. 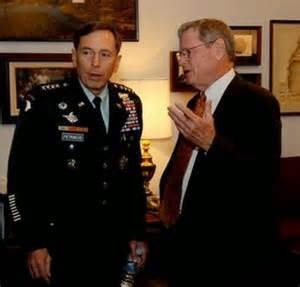 Numerous intellectuals, political leaders from the region, “penitent” NATO officers and well reputed Russian generals either participated in or were guests of our events. We believe that we can do more and perform better! This presentation will help you judge our results. By organising international and regional conferences, lectures given by reputed experts and media campaigns organised by us, our mission is to practically inform our citizens on the results of possible Montenegro’s entry into the NATO alliance, with a reputation of military, offensive and fully occupational machinery . And finally – to obtain the referendum at which the citizens (and not public authorities) shall pass a decision on (non) entry into NATO in a democratic way. The Montenegro’s NGO network “No to war – No to NATO” became a full member of the international network “No to war - No to NATO” at its annual assembly held in March 2013 in Gent, Belgium. The international network peace movement “No to war - No to NATO” was established in Stuttgart in October 2009. More than 650 organisations from over thirty (30) countries signed the declaration, which meant formal start of the peace initiative called “Not to war – No to NATO”. Smedley Darlington Butler (1881-1940) was a Major General in the U.S. Marine Corps, an outspoken critic of U.S. military adventurism, and at the time of his death the most decorated Marine in U.S. history. In November 1934, Butler alleged the existence of a political conspiracy of Wall Street interests to overthrow President Roosevelt, a series of allegations that came to be known in the media as the Business Plot. 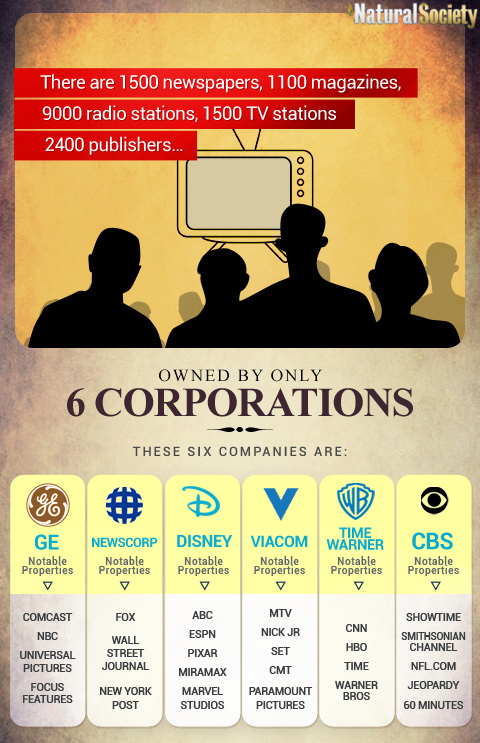 It is sad that the US corporate run media won't report any real news anymore. But I am determined to keep searching for any truths I can get my hands on. I'm tired of seeing the crap we get ladled each day from the likes of 'war hero' Brian Williams and his ilk - including National Public Radio (NPR). Quite a commentary when more people are watching Jon Stewart for news than the slimy networks. I guess though it's a good sign.... means more folks are figuring things out at last. The German federal television channel ZDF got into a bit of trouble recently after a citizens' media monitoring group called them out over false reporting on the presence of Russian tanks in eastern Ukraine. A German media monitoring organization has filed a complaint against federal channel ZDF over false reporting on the situation in eastern Ukraine, Deutsche Wirtschafts Nachrichten has reported. About 8,000 Kiev troops have been surrounded for the past week by the self-defense forces in eastern Ukraine. The US puppet President Poroshenko keeps denying this fact but his soldiers are calling home to momma on their cell phones and saying they are out of ammo, food, fuel, etc. Some mothers took to the streets blocking traffic with banners to bring this truth to the public. The self-defense forces in Donbass offered a 'green corridor' to leave what is called the Debaltsevo cauldron. The self-defense forces only demanded that Kiev's Army leave their weapons and walk toward home. Senior Poroshenko though has refused to allow his troops to leave this mess he got them in. Instead he forces his Army to die or surrender. Many are indeed waving the white flag and choosing to live. They are beginning to understand that the US-NATO war in Ukraine is not their fight. Their mothers are telling them to walk away from the Kiev-Washington war. Here is a joke going around about Kiev's Army which is losing to eastern self-defense forces which are made up of ordinary citizens just trying to protect their families and land: "To lose is always painful. It’s a hardship especially when you lose to yesterday’s miners and tractor drivers. But life is life." 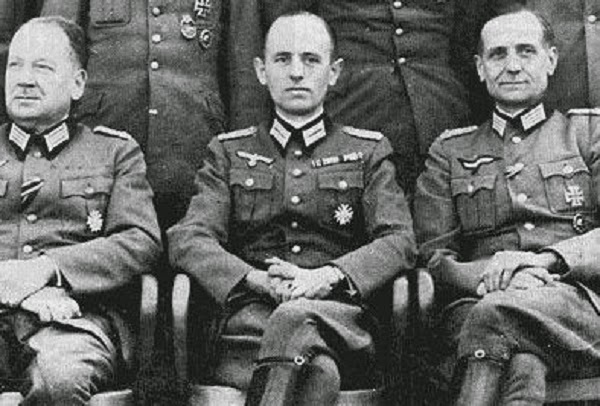 Stepan Bandera (center) was a Ukrainian nationalist leader who supported the WW II Nazi invasion of the former Soviet Union. 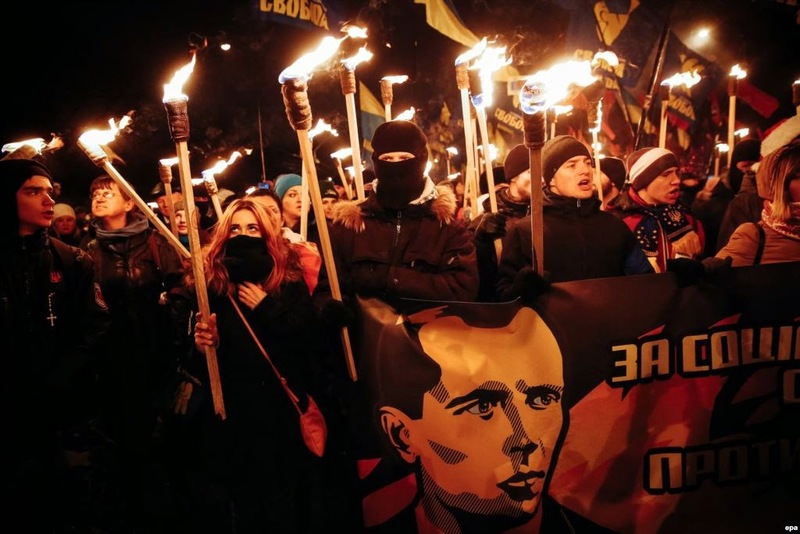 Today Stepan Bandera remains the ideological hero of current Nazi's in Ukraine who are waging war against their fellow citizens in eastern Ukraine who live near the Russian border. Andriy Parubiy was a founder of the Social-National Party of Ukraine, or Svoboda, which the CIA renamed the “Freedom” Party in order to hide its origin as Ukraine’s Nazi party. 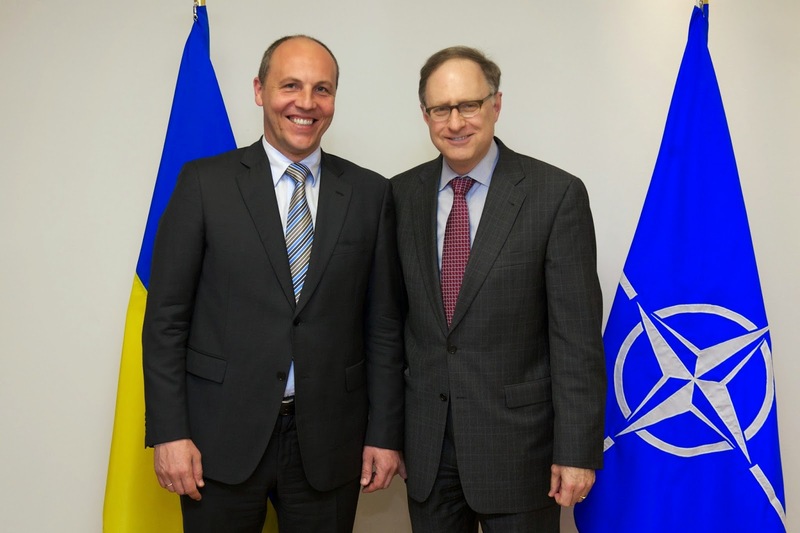 Parubiy is the former Secretary of the National Security and Defence Council of Ukraine, appointed after leading the 2014 anti-government coup d'etat in Kiev. Parubiy announced on February 15 that, “Next week I'm off to the United States to speak about this very subject” of getting Washington to supply the weapons necessary to finish the job of killing legions of Russian speaking Ukrainian citizens in the eastern part of the country - what is usually referred to as the Donbass region. That constant bombardment requires lots of bombs and bullets, which is why Parubiy is heading to Washington. Crimea's Chief Prosecutor Natalya Poklonskaya, who lived in Kiev and was a criminal prosecutor in Ukraine’s national government until the 2014 coup, quit her former post because she didn’t want to serve in what she called a “Nazi” government which was being established after the coup. She says that Parubiy “was the leader of the armed part of Maidan” -- he was the key organizer of the masked snipers who dressed as government forces and shot both the police and the Maidan demonstrators during the coup and so brought down the sitting President of Ukraine. But Hitler turned on his western backers, got greedy, and went for the whole ball of wax. In the end Nazi Germany did invade the former Soviet Union but also attacked the capitalist countries in Europe. The rest is history. The western capitalist countries, today led by the US and a hyper aggressive NATO military machine, still long to take down Russia even though that nation itself has become capitalist. But Russia sits on the world's largest supply of natural gas and significant supplies of oil. Russia also has the largest land border with the Arctic Ocean and due to the melting ice, as a result of climate change, the US and western oil corporations are drooling over the prospects of controlling that entire region. But Moscow, and a resistant Putin, stand in the way. Thus we see this ugly alliance with Nazi's in Ukraine that has become the current strategy to create instability along the Russian border in hopes of destabilizing the government in Moscow. This of course is being done in conjunction with major expansion of NATO military operations into eastern Europe and the Baltic states that also border Russia. Missile defense deployments in many of these NATO outposts are an attempt to give the US the hope of a successful first-strike attack capability on Russia. It is indeed hard for the American people to wrap their heads around the fact that the US is actively collaborating with Nazi's today. It is even harder for people in the US to contemplate that our nation's current program of endless war and 'Full Spectrum Dominance' are so similar to the Nazi slogans of 'blitzkrieg' and 'Deutschland über alles'. The truth is always hard to swallow. I stayed up quite late last night rereading a book by former CIA agent Philip Agee. I had the great fortune to meet Agee twice - the first time organizing a speaking event for him in Orlando in the 1990's that drew folks from across Florida. The second time I visited his home in Hamburg, Germany in 1995 while on a speaking tour against NASA's Cassini plutonium launch. Agee is one of my heroes - he was a man of true conscience who left the CIA after serving for about a dozen years in Latin America. He was determined to publish a book exposing the wicked work of the CIA and after a difficult four-year period he was able in 1974 to release his book entitled Inside the Company. From that day on, Agee was marked by the CIA as its enemy. He was hunted, arrested, threatened, expelled from country after country (often illegally) and sometimes prosecuted. He tells this riveting story in the 1987 book entitled On the Run. This is the book Agee gave me when I visited him in 1995 and began rereading last night. Agee was from Tampa, Florida and had a sister in the Orlando area. He put me in touch with her and she began coming to our office at the Florida Coalition for Peace & Justice in the 1990's to help put out bulk mailings. She was the one who arranged for her brother to speak in Orlando at the statewide event that I organized that filled a huge downtown Methodist Church. Then when I went to Germany on my speaking tour in 1995 Agee's sister made it possible for me to stay with her brother. When I visited Agee in Hamburg he took me on a walking tour of parts of the city. That evening he took me to a wonderful Italian restaurant that had a spaghetti sauce that I'll always remember. We had fascinating discussions about his life-long efforts to expose the crimes of the CIA. He was a very humble and ordinary guy and I really grew to admire him tremendously. In his later years Agee moved to Cuba and started a travel business to help people make the trip to that 'forbidden nation'. He died there in 2008. Agee was truly in the mold of Ellsberg, Snowden, Manning and other such remarkable whistle blowers. I would try to show how our [CIA] operations help sustain favorable operating conditions for US-based multi-national corporations. These conditions, together with political hegemony, were our real goals. So-called liberal democracy and pluralism were only means to those ends. "Free elections" really meant freedom for us to intervene with secret funds for our candidates. "Free trade unions" meant freedom for us to establish our unions. "Freedom of the press" meant freedom for us to pay journalists to publish our material as if it were the journalists' own. When an elected government threatened US economic and political interests, it had to go. Social and economic justice were fine concepts for public relations, but only for that. because it was old news. by the same journalistic standards. I'm certain the BDN scribe was insulted by such audacity. How dare you say such things to me he must have thought. They were on the case and had it under control. with your otherwise wasted lives. The pages are filled with all the news that is fit to be printed. and politicians tell us they are almost there. and returning heroes from a war far away. that all is well here at home. That democracy and the old ways are sound. the keep the fires burning. Somehow the spirit rages on. so we can be free again.